Imperial Fuding Silver Needle (also: White Hair Silver Needle, Baihao Yinzhen 白 毫 银 针) White Tea from Fuding County, Fujian province, China, the original – often imitated, never reached: the first spring picking (“first flush”) of only the young buds from the Fuding native “Da Bai” tea plant variety. Silver Needle (also: White Hair Silver Needle, Baihao Yinzhen 白 毫 银 针) White Tea is one of the two main and best known types of white tea. Just like its white tea sibling, Bai Mu Dan (White Peony), it originates from the northern and northern east parts of the Chinese province of Fujian. 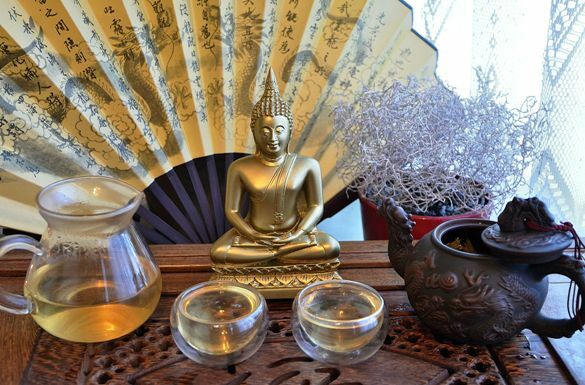 There, the production of Silver Needle Tea is centered in the regions of Fuding and Zhenghe, where the specific processing method for white tea as we know it today has only been developed during the second half of the 19th century. 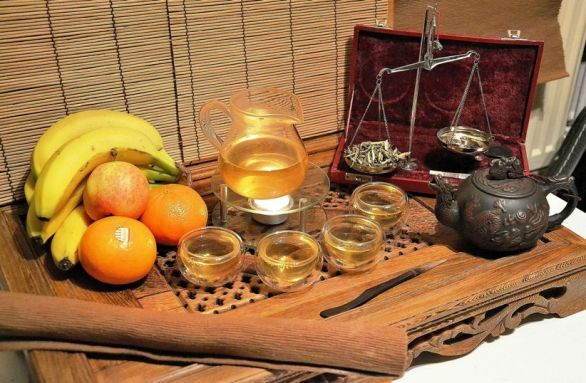 This makes white tea the youngest among the six classic categories of Chinese teas. Genuine white tea is made from a specific group of Camellia Sinensis subvarieties, the “Da Bai” (= great white) tea plant variety, which is native in the north and northeast of Fujian and characterized by the tight cover of silver-white hair on its young buds. While the White Silver Needle tea consists only of these young buds, deriving its name from their shape and appearance, Pai Mu Tan is picked in the form of 1 bud plus the 2 uppermost pertaining tea leaves, giving the Pai Mu Tan a fuller and stronger taste, while the aroma and taste of the Silver Needle stick out through their noble elegance and delicate subtleness. Though the specific processing method for white tea today is reproduced also in other parts of China as well as in other tea growing regions such as India and Taiwan, these imitations rarely make it up to the original from Fujian. There are two major cultivation regions for the Da Bai cultivar, respectively centers of production for White Hair Silver Needle, in Fujian, which are Zhenghe in the north and Fuding in the northeast of the province, with their typical versions of White Hair Silver Needle teas respectively showing significant differences. This is once due to differences in the characteristics of each region’s subvariety of the base cultivar („Da Bai Fuding“ and „Da Bai Zhenghe“), and second due to different local processing standards. For example, the “Zhenghe Style” Silver Needle Tea is typically processed to a significantly higher degree of oxidation (“is darker”) than a “Fuding Style” Silver Needle Tea. Traditionally, the freshly harvested buds are initially spread on large bamboo trays and left to wilt in the sun for an extended period (24+ hours). While the best qualities of White Hair Fuding Silver Needle might still be produced this way in Fuding today, shifting this process to indoors facilities with artificial warm air ventilation has become quite common, too, in order to prevent damages and losses due to sudden rainfalls. After wilting, the now sleek tea buds are piled for oxidation (often incorrectly referred to as “fermentation”) before this process is stopped through heating (traditionally in a wok over charcoal fire, today often done by machines) in another processing step. Our Imperial grade White Hair Silver Needle Tea comes from Fuding, the original place, where the worldwide finest and most popular white teas are grown and produced. “Imperial Grade“ here means that for this tea only the young buds of each year’s first spring harvest (end of March to beginning of April) are picked, best shortly after sunrise, as soon as the moistness on the tea plants has fully evaporated in the warmth of the sunlight. We did not shy investing a costly and time-intense effort virtually working ourselves through an extended range of different supplier’s offers of different grades and styles to identify this White Hair Silver Needle Tea as our favorite. 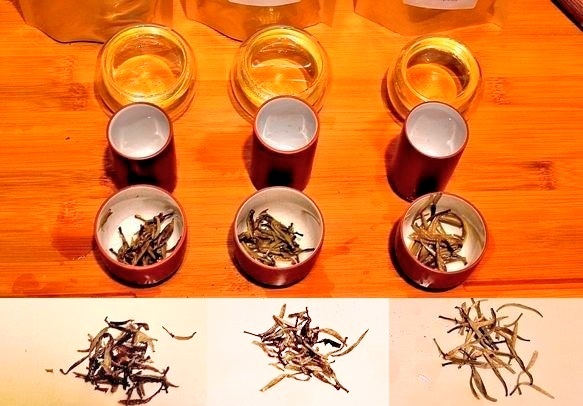 The dry leaves of the freshly processed, only lightly oxidized Fuding Silver Needle Tea due to their tight cover of characteristic white hair initially show a shiny white color with a very light touch of green, but with time will “grey” and take on the silvery-grey appearance that has contributed to the tea’s name, “silver” needle. The white hair reflect the light, giving the slightly crescent-shaped “needles” a radiant appearance that visually underlines this tea’s noble character. Their aroma, unfolding in the infusion in a way that truly indulges the senses, is that of fresh, soft spring flowers and is reflected in the highly translucent bright yellow infusion’s taste, with fresh and mellow, subtly honey-sweet notes, once again highlighting this tea’s unique elegance. White tea in general and White Silver Needle tea in particular is said to possess a downright legendary range of health benefits. There are claims that white tea is even superior to green tea when it comes to medical properties and effects. White tea is particularly rich in polyphenols and catechins and is often linked to strong antioxidant, antibacterial and antiviral properties and assumed to strengthen cardiovascular functions, lower cholesterol levels, support good tooth health and possess general anti-aging effects. 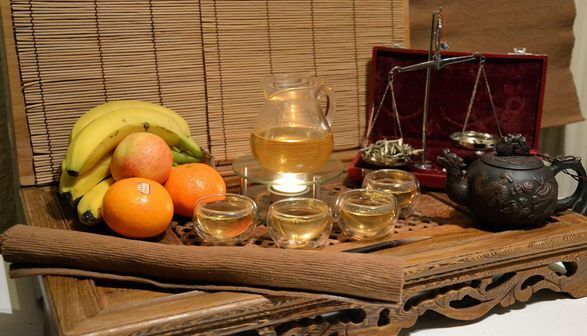 In Traditional Chinese Medicine, white tea is used to lower body temperature as well as for detoxifying applications. However, given the exquisite noble-sweet taste of this tea, we believe that our Imperial Fuding White Silver Needle Tea well deserves to be enjoyed for its gourmet properties in the first place, whereas possible positive health properties might be considered as desirable side effects. We often find rather unusually long infusion periods of around 5 minutes recommended for White Silver Needle tea, along with high dosaging compared to other Chinese teas. While such recommendations are to seen in the backdrop of the highly “forgiving” character of this tea, whose taste doesn’t seem to suffer any considerable damage from infusion periods and dosaging, especially friends of the subtle delicacy and elegance of White Silver Needles will prefer shorter infusion periods of 2-3 minutes (or less). This way, a high grade Silver Needle White Tea like ours will also produce a good range (3-4) of delicious infusions. As for the dosage, we’d suggest a “normal” dosage of 3.5g-5g for 250ml-350ml hot water of a temperature between 80°C and 85°C.